Sven Lütticken argues that it is only by facing the ongoing process of extraction and abstraction of the pre-capitalist that the commons becomes a political and an aesthetic project. He asks what contributions artistic or aesthetic practice can make to practice directed against our current regime of accumulation and abstraction. The aim would not be to instrumentalise art in the name of a political project, but to sound out possibilities for an aesthetic contestation in conjunction with a political one. Metahaven, illustration Captives of the Cloud, Part I, 2012. Capitalist expropriation and extraction are processes of abstraction. Commons are made productive by being abstracted from their status outside the capitalist Wertschöpfungskette [value chain]. Kluge and Negt note, “Throughout history, progress above all seems to be made in the development of the principle of abstraction. Whenever it intervenes, a new dynamic is likely to emerge.”6 In their History and Obstinacy, Kluge and Negt engage in a rereading of the history of capitalism, in Germany in particular, though the Marxian notion of primitive accumulation, stating that “Capitalism rests on the principle, that — for the first time in history — its abstractions break through into the productive sector.”7 This is not a bad encapsulation of the industrial revolution, with its partial mechanisation of the production process and its reduction of workers to wage-labourers who only have their abstract labour power to sell (or, in the case of slavery, not even that). Accumulation as abstraction liquidates or liquefies concrete particularities through monetary equivalence. In this sense, it is a real rather than merely conceptual abstraction. Marx had criticised Hegel’s philosophical notions because they remained philosophical concepts, in spite of their claim to concretion.8 When Marx analyses the fundamental role of abstract labour in capitalism, or when economist and philosopher Alfred Sohn-Rethel takes pointers from Marx in analysing money as a real abstraction, something else is at stake: the social and economical reality of abstractions, as opposed to Hegel’s philosophical abstract concepts. In marked contrast to complaints about the increasingly abstract nature of the economy, of technology, of society as a whole, Marxists insist that the issue is not one of increasing abstraction, nor one of the failure of the abstract, but of the becoming-real, becoming-concrete, becoming productive of abstraction itself. Kluge and Negt argue that production was always chained to the concrete, but capitalism unchains production through abstraction. Labour itself becomes abstract labour, labour-power sold like any other commodity, a real abstraction. The abstraction of primitive or original accumulation has to be permanent, since capitalism critically depends on the existence of a non-economic outside to the market. As Nancy Fraser states, “capitalism is something larger than an economy,” as the capitalist economy needs a “non-economic background” that is both external to it and potentially open to incorporation, to appropriation and expropriation — to abstraction.9 If the commons — which are forever present by forever being in the process of being made history — now hold the promise of a different future, this does not mean that commoning should be construed as a reversal of abstraction, as re-concretion. For one thing, abstraction cannot be fully equated with the process here described. If anything, the becoming-productive of abstraction in capitalism is a becoming-concrete of the abstract itself. This, effectively, is our common world. In a critical response to Hardt’s analysis of neoliberalism as entailing “a seizure of what is common — knowledge, language, images and affects,” political theorist Jodi Dean has maintained that the concepts of the common and the commons have a potential for depoliticisation by de-emphasising division and antagonism within the “common.”10 If one looks at the use and abuse of commonist rhetoric in the neoliberal “Big Society” context, the point is well taken. As Dean maintains: “Division is common. We have to seize it.”11 Starting this process means identifying and intervening in current processes of “permanent primitive accumulation.” These form a negated commons — a negative commonality of (unequally) shared expropriation and abstraction, of equivalence in the service of the expropriators. It is only by facing the ongoing extraction and abstraction of the pre-capitalist that the common becomes a political and an aesthetic project.12 Abstraction is common. We have to seize it. What, if any, contributions can artistic or aesthetic practice make to practice directed against our current regime of accumulation and abstraction? The aim, of course, would not be to instrumentalise art in the name of a political project, but to sound out possibilities for an aesthetic contestation in conjunction with a political one. All too often, it appears that art today is held hostage by the (un)real abstractions of finance capital. A case in point was an Occupy protest in Chicago in 2011, which focused on the Art Institute of Chicago; the august institution, home to Georges Seurat’s Grande Jatte (1884–1886), was hosting a cocktail reception for the futures industry.13 L’1%, c’est moi: the profound implication of the contemporary art market in a financialised economy marked by a rising income and wealth gap makes the Chicago montage of artworks, futures traders and protesters symptomatic and significant. Yet art also provides tools for thinking through and acting in the deepening systemic crisis. Modern “abstract” art and its discourse were a problematisation of abstraction. Already in the inter-war period, so-called abstract artists were well aware that their work constituted such a failure, and they modified or rejected the term “abstract art.” Piet Mondrian called his neoplastic work “abstract-real” art and Theo van Doesburg and others later preferred the term art concret or concrete art.14 These are not just minor semantic squabbles. 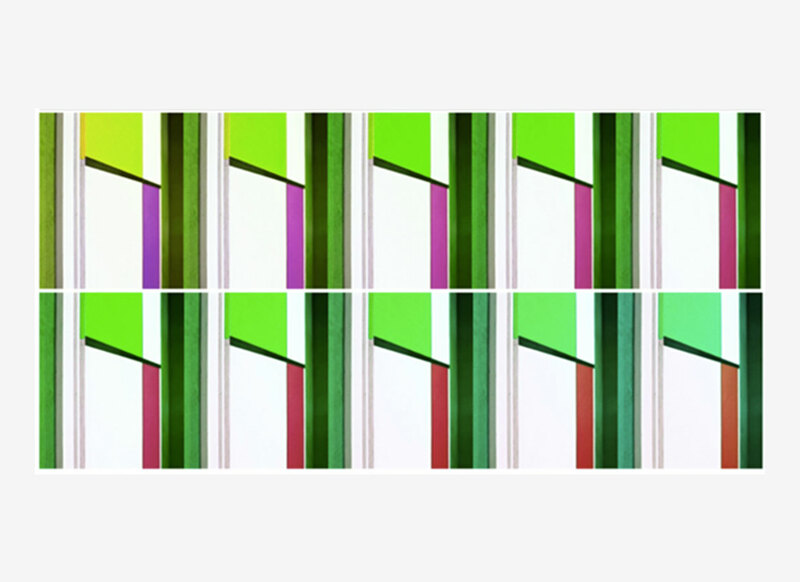 As Liam Gillick has claimed, one might well argue that modern art was actually marked by a failure of the abstract: “By making the abstract concrete, art no longer retains any abstract quality, it merely announces a constant striving for a state of abstraction and in turn produces more abstraction to pursue. It is this failure of the abstract that lures and hypnotises — forcing itself onto artists and demanding repeated attention. […] It is the concretization of the abstract into a series of failed forms that lures the artist into repeated attempts to 'create' the abstract — fully aware that this very act produces things that are the representation of impossibilities.”15 Art as the concretion of the abstract into failed forms; indeed, for much of modernity, the bourgeois “ideology of the aesthetic” has glorified art as the realm of achievement and experience in which the subject is reconciled with the object, in which reason is reconciled with the senses. Against the increasingly arid and abstruse abstra ctions of science, art stood for an engagement with the concrete, with the senses — on the human scale. Paul Chan, New New Testament, 2014. The division between art and science as a division between concretion and abstraction was repeated within the domain of science itself, within the university, by the division between natural science and the humanities, with the former being marked by “geometric formality,” as Michel Serres calls it, and the latter by personal relativity.17 But in reality, as Serres also acknowledges, the situation was more complex. Serres notes that the French university was traditionally split between humanities, science, and medicine and law. Serres argues that a “third subject besides that of science and humanities is born in those medical and law faculties.”18 In this sphere of thirdness, a new procedural, algorithmic reality conquers both the sphere of abstraction and of the concrete. In medicine, science abstracts from the minutiae and accidental details of sense data is used to create a feedback loop, to make incisions, to make cuts, in order to heal the body. Abstraction saves lives. In recent decades, medical and biological research has of course penetrated increasingly fundamental mechanisms, with genetic cures becoming a real possibility. Medicine, in short, stands for the erosion between fundamental and applied research, between science and technology. The resulting continuum is often termed technoscience. Law provides the protocols that regulate the operations of biological technoscience, just as it regulates the economy — especially the financial sector. The “liberalisation” of financial markets is of course itself a form of regulation. And the financial sector is crucially dependent on technoscience in the form of high-frequency trading algorithms whose autonomous actions that far outrun the human capacity to react can spark a so-called flash crisis. Serres’s thirdness is what I call concrete abstraction.19 Concrete abstraction is the culmination of the productive turn of abstraction, marked by ever tighter integration of different vectors of “real abstraction”: financial, technoscientific, legal. In such forms of real abstraction, the abstract becomes operative, operational, to an even greater extent than during the industrial or Fordist era, which was marked by a degree of relative autonomy of the different spheres. In what one could call the Weber-Habermas-Bourdieu account of modernity, an essential characteristic of modernity was the increasing functional differentiation between, and relative autonomy of, different social spheres such as science, law and art.20 We are, in fact, dealing with a dialectic in which operative abstraction first results in such functional differentiation, but ultimately propels a market- and technology-driven reintegration. To be sure, the “vectorial” definition of concrete abstraction acknowledges that the process of integration can be traced back to the heyday of ind ustrial capitalism, yet there were social and ideological as well as practical limits to integration. The modern distinction between science and technology is telling in itself. Whereas the latter was clearly closely connected to the development and improvement of industrial production, the former kept its distance to focus on fundamentals. Now, in the age of technoscience, at least some semblance of immediate economic or social usefulness is expected even in the humanities — in which quantitative methods and cognitive computing are being promoted. All hail the creative industries! As this term shows, Kluge and Negt’s notion of the Produktionssektor has become problematic. Production has increasingly become cognitive, semiotic and affective; in heavily financialised neoliberal economies, it is often here that the potential for accumulation seems to be located. Art itself has been turned into a financial product and ma de productive as a means of wealth redistribution. What was a problematic cybernetic vision in the late 1960s has become a sprawling, scattered post-Internet reality in which the late-modernist overtones of much early computer art seem quaint. It is no longer a matter of creating concrete structures or events through algorithmic logic, but of operating within a culture and a society that follows an algorithmic and networked logic to begin with. For starters, the art market is becoming software-based almost as much as (other) financial markets. While some major collectors have their own custom-built algorithms, websites such as ArtFacts and ArtRank offer help to a larger group — with the latter site “[identifying] prime emerging artists based on qualitatively-weighted metrics including web presence (verified social media counts, inbound links), studio capacity and output, market maker contracts and acquisitions, major collector and museum support, gallery representation and auction results.”23 Meanwhile, this art market remains largely dependent on pre-digital and in fact pre-industrial notions of authenticity and uniqueness, into which digital works have t o be fitted (limited editions, etc.). Things are rather different in publishing, always a matter of mass (re)production, where digitisation puts an end to old business models. The artist Paul Chan operates in both economies, making work for the gallery and museum circuit and running the publisher Badlands Unlimited, which publishes ebooks as well as paper books. His artwork Volumes (2012) was actually conceived in response to criticisms he received for publishing ebooks with Badlands Unlimited, and hence supposedly helping to “kill the book.”24 Volumes consists of gutted and mounted and painted-on book covers; one cover bears the phrases “High-abstract” and “abstract critical.”25 “Abstract critical” is the name of an organisation promoting neo-modernist abstraction, and this is the cover of a 2011 show they organised at the Poussin Gallery in London titled High-abstract. This is all bizarrely retrograde, and Chan clearly has fun appropriating this catalogue and integrating it into his own exploration of abstraction, which is much more wide-ranging. The gray rectangle he added appears to turn it into a modernist composition, but of course it is also a book, a reminder of the discursive side of art, a rejection of the idea of pure opticality. In any case, Chan is a devotee of Theodor Adorno rather than Clement Greenberg, and hi s take on abstraction takes in dimensions beyond the formal. In his account of Adorno a statement about the “absolute work of art” meeting “the absolute commodity,” philosopher Stewart Martin returns to Marx’s analysis of commodity fetishism, arguing that it distinguishes between two forms of illusion: that of the commodity’s sensuousness, and that of the autonomy of its value from labour. “Adornoʼs account of the autonomous artwork effectively mobilizes the first illusion (fetishism) against the second illusion (the autonomy of capital). The autonomous artwork is an emphatically fetishized commodity, which is to say that it is a sensuous fixation of abstraction, of the value-form, and not immediately abstract. This is what remains irrevocably aesthetic about the artwork for Adorno, despite its constitution by the non-aesthetic abstractness of value.”26 On the other hand, with Karel Kosík’s terminology one could stress that this remains precisely an illusion, and that while the artwork is not “immediately abstract,” its sensuous appearance is itself pseudo-concrete.27 It is not so much that “art no longer retains any abstract quality,” but that its concretions are a matter of appearance only, for th e artwork is really an abstract commodity, exchange value. But, as Chan’s practice demonstrates, it is hardly sufficient anymore to talk about “the artwork” in a general sense, as though it was not beset by ever deepening contradictions, nor is it legitimate to isolate monetary and financial factors from other forms of concrete abstraction. Chan’s large Volumes installation in Basel has a compendium in the form of a massive Badlands publication called New New Testament, in which Chan accompanies images of the book covers with scrambled code poems. The New New Testament is available as a hardcover and as a series of ebooks, which makes it possible to own and have access to what is in some ways a more complete version of Volumes than the installation itself; but of course the installation offers the senses something that the book(s) cannot, and its physical qualities and uniqueness give it the status of a potential investment that the paper book, let alone the ebooks, can never attain. Capitalism obviously presupposes private property guaranteed by law, and administered by legal institutions and jurisprudence — but what it means to own a book is being redefined by the agreements one signs when purchasing ebooks. Suddenly a book you thought you owned has melted into digita l thin air. Ownership is becoming ever more partial and temporary, and complex and contradictory. Aesthetic and political strategies within concrete abstraction need to engage with such faultlines — faultlines created by ongoing and intensifying processes of accumulation and expropriation. Crucial for both these processes and for critical intervention in them are design strategies. When abstraction becomes concrete, it takes the form of design. In a famous cartoon by Ad Reinhardt, a little bourgeois man mocks an abstract painting for not representing anything; the painting then grows a face and asks the man: “What do you represent?28 The question, intended as a defence of abstract painting against philistine attacks, is more relevant than ever. We may be inclined to raise the question of abstraction and what it “represents” to artworks, or to clouds or financial algorithms, but it is echoed right back at us. To paraphrase a phrase from Walt Kelley’s comic strip Pogo: we have met abstraction, and it is us. It is us insofar as we are subject to design, insofar as we are design. “Self-design” is perhaps the ultimate manifestation of today’s total design, yet the designing of the self is hardly only the work of the subject whose self is on the line.29 Je est un autre. In writing on “becoming a curve,” Haghighian attempts to reclaim some degree of agency, fighting against her uncanny data-design doppelgänger. The graph clearly does not do justice to her life and practice in any way, yet its abstract-concrete representation of her career threatens to usurp her place. The abstracted, elegant version of the graph on the essay’s title page turns it from an investment tool into something much less functional; something closer to the real abstractions of modernist art, sensuously concrete but far from “productive.” On the other hand, artists ranging from Andreas Siekmann and Alice Creischer to Andrea Fraser are also engaging with information design much more directly.31 Aesthetic practice becomes critical information design, an attempt to visualise the patterns, flows and divisions of concrete abstraction. Such practices suggest that Hal Foster’s attack on “total design” in Design and Crime (2002) was, paradoxically, marred by an insufficiently total understanding of design. While Foster argues that everything from jeans to genes is now subject to design, he barely acknowledges that this also creates a field for critical appropriation. While its practitioners were intent on establishing design as a separate discipline distinct from visual art, emphasising the autonomy of their practice by formulating strict design-aesthetic criteria and procedures, design is also a great equaliser and great integrator, a destroyer of autonomy — including its own. Design as the universal agent of concrete abstraction is no longer one discipline, if it ever was; as total design, which includes exhibition design, graphic design, information design, bio-design, self-design — everything and the kitchen sink. If there is a problem with Foster’s take on total design, it is not that it is too totalizing but that rather it is not total enough; his analysis addresses design as commodity fetish but not as omnipresent process, as a productive operation that we all participate in willy-nilly — and that may at times be converted into critical aesthetic practice. The design collective quotes from a 2011 paper by students of the US Naval Graduate School, which states “data sovereignty provides an explicit tool to break a level of abstraction provided by the cloud. The idea of having the abstraction of the cloud when we want it, and removing it when we don’t, is a powerful one,” with Metahaven adding the conclusion that “To break down the abstraction of the cloud, the internet needs to be more localized.”38 Metahaven here argue precisely that part of political and aesthetic practice today is to insist on the concretion of abstraction, to refuse to assent to vague generalities Datacenters are somewhere, hidden in plain sight. Specific cables are tapped at specific locations by a particular intelligence organisation named GCHQ. Iceland and other states may provide better conditions for data storage than most; or what about an “Anonymous” container ship in international waters, connected with Island via a cable? A photo of a model of such a ship on a map is incorporated in one of the illustrations of Captives of the Cloud. The image recalls artist Allan Sekula’s investigations onto the containerisation of shipping, which is itself closely linked to the financialisation of the economy in the 1970s and 1980s.39 Flows of data, flows of goods: it is not so much that the economy has become “immaterial” (a narrative Sekula always opposed, and rightly so), but that abstraction has progressively colonised the world. If the container ship image is part of a photographic montage, many of the other “illustrations” are purely typographic. They look like 1920s new typography remixed by some kind of digital postmodernism generator. 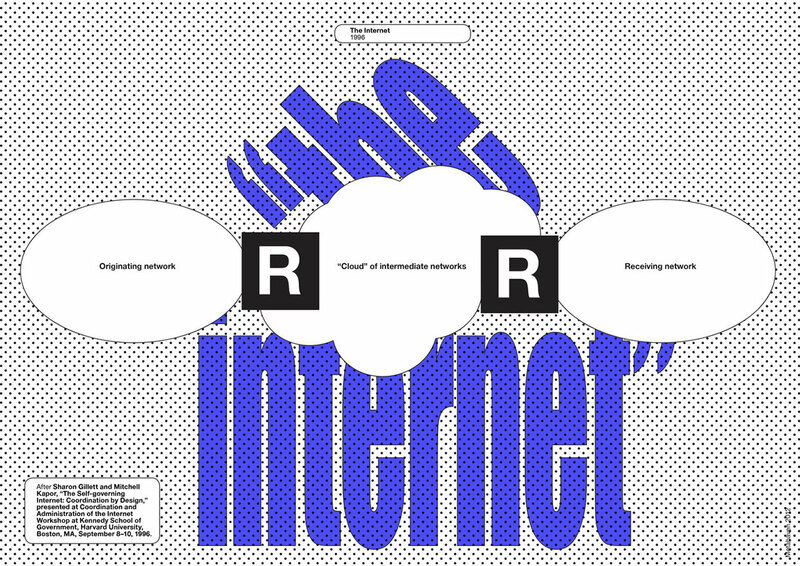 One of the illustrations is a redrawn version of a 1996 diagram of “the cloud” from a 1996 MIT research paper.40 Metahaven’s added frills don’t appear to add much except surface design, which is rather distracting. But perhaps this “distraction” is the point; the diagram no longer appears as a neutral representation of some eidetic essence, but as a somewhat obtrusive concretion. If Foster’s account of total design still depends on a habitual operation of critical distancing from total design, even while his analysis casts doubt on the very possibility of such critical distance, Metahaven’s practice consists of distancing acts within total design. Such interventions have to contend with realities that are defined by international and national law, as well as with the systemic transgression of those legal realities by government agencies sworn to uphold them. In all its fuzziness, the cloud is a perfect example of our negative commons of expropriation: we willingly upload our stuff, externalise our brains, into a paralegal limbo. Dealing with issues of extraterritoriality and “rogue states,” Metahaven partake in the legal turn of contemporary aesthetic practice. Design as operative principle of advanced capitalism depends on the concatenation of the three main vectors of abstraction: financial, technoscientific and juridical; it is the operative logic of this concatenation. Apple, with its slickly designed products, its user agreements, cloud services and backdoors, is the quintessential design corporation of the early twenty-first century — and both with Apple and in general, it is the legal parameters, supplemented by their shadowy extralegal or paralegal supplements, that ultimately hold everything in place. Hence practices such as Metahaven’s — but one could also mention artists Superflex or Agency — focus precisely on the conjunction of design and law.41 Foster’s Loos-inspired title Design and Crime is more to the point than he may have realised. Aesthetic practice is ever more implicated in legal protocols, in the constantly renewed division between people and products incorporated into the circuits of contemporary capitalism and the sphere of extralegality and non-property waiting to be appropriated. Perhaps the ultimate design project today is money; not in the sense of the graphic design of specific coins or banknotes, or alternative currencies, but in that of currency as such. Money is subject to design in a fundamental sense precisely because contemporary money is the product of a financial system transformed by the interplay of computing and new legal frameworks — by technoscience and neoliberal policy. New financial products are designed to produce crippling debt for the many and huge financial windfalls for the few, and currency itself is a prime subject for algorithmic speculation — a speculative investment before it is anything else, its value up for grabs. Even as ArtFact’s algorithm charts Sadr Haghighian’s career, her drooping graph adds value to ArtFacts.net in an underhand way. In the attention economy of the age of Facebook, users constantly generate value — in ways that are hard to quantify. The Marxist notion of abstract labour was based on quantifiable forms of work, on statistical averages that could be expressed in the real abstraction of money. While repetitive industrial labour is to a large extent farmed out to low-wage countries (or migrants from low-wage countries), “immaterial” labourers in advanced economies are no longer exclusively or primarily seen as purveyors of abstract labour power, but as people who bring unique qualities to the process. Laurel Ptak, screenshot web site Wages for Facebook. 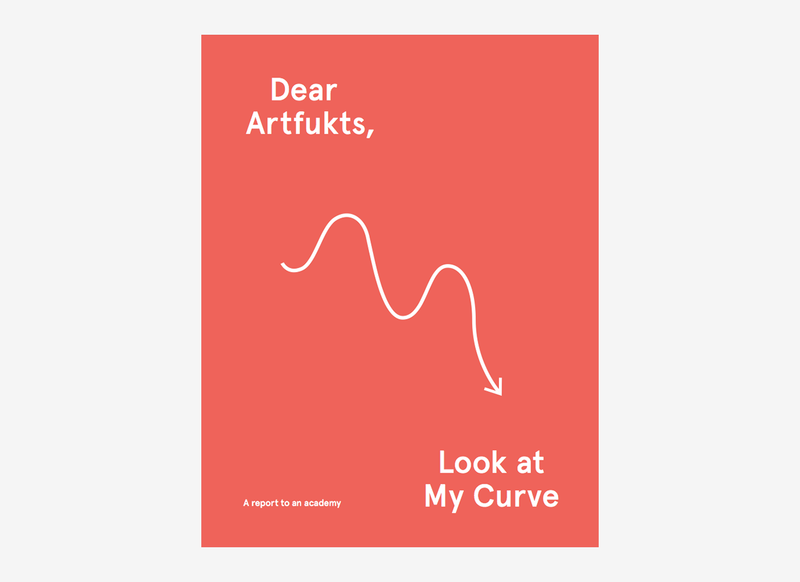 Natascha Sadr Haghighian, title page Dear Artfukts, Look at my Curve, 2013. Today it is difficult to determine what constitutes a vanguard and a rearguard, as the “end of money” has been replaced by — or takes the form of — a proliferation of alternative currencies and cryptocurrencies. Of course, alternative currencies have a long history, becoming particularly widespread in times of crisis, and generally trying to minimise the potential of currencies for speculation and wealth accumulation while exploiting their qualities as a medium of exchange. For all their high-tech dazzle, current cryptocurrencies have certain conservative traits.45 Bitcoin, the most famous of cryptocurrencies, is built on artificial scarcity and deflation. Bitcoin almost has the caricature of gold: like a precious metal, there is only so much Bitcoin that can mined. Unlike gold, the exact amount had been set, which makes this neo-gold skyrocket in value and behave like “dotcom stock” rather than as a genuine currency.46 Intriguingly, a very different kind of “naturalisation” of money by recourse to gold as model has been proposed by David Harvey in a design for an alternative currency that has met with much interest in commonist circles. In a move seen by many as betraying Marx’s insistence on the end of money under socialism, Harvey has argued that of the various functions of money — traditionally described as medium of circulation, storage of value, and measure of value, that of circulation is relatively neutral and unproblematic. The problem, Harvey argues, lies with storage and accumulation, with the hoarding of social power in money form — leading to class formation. “Or on the monetary question — we need money to circulate commodities, no question about it. But the problem with money is that it can be appropriated by private persons. It becomes a form of personal power and then a fetish desire. People mobilise their lives around searching for this money even when nobody knows that it is. So we’ve got to change the monetary system — either tax away any surpluses people are beginning to get or come up with a monetary system which dissolves and cannot be stored, like air miles.”47 In his proposal for an “anti-wealth and anti-accumulation currency,” Harvey uses the notion of oxidisability. Historically, gold and silver were chosen because they are non-oxidisable and therefore perfect for storing value. With digital means, Harvey suggests, it should be relatively easy to create an oxidisable currency with built-in obsolescence, which gradually loses its value — in a kind of reversal of Bitcoin. In the wake of Occupy Wall Street, Harvey’s proposals have been discussed at 16 Beaver, who have also collaborated with theorists David Graeber and Silvia Federici, and who organised a series of lectures and seminars on the “subversion of money” and alternative currencies. In this context, the group sound a warning note about attempts to “redesign money” that tacitly mirror the neoliberal reduction of money and of “the economy” to autonomous systems with their own laws: “Rather than begin with the money form, could one instead begin with the kinds of social relations one aspires to and then find the appropriate strategies to facilitate modes of exchange or cooperation? How to think money without money subsuming thought?”48 How, indeed? One problem is that many critiques and alternatives are still haunted by a romantic and unproductive opposition between the concrete and the qualitative on the one hand, and the abstract and quantitative on the other. With his romantic-anthroposophic conception of art and society, Joseph Beuys was in many ways a key protagonist of the qualitative avant-garde. In stark contrast to the anti-statist ideology of most contemporary alternative and cryptocurrencies, Beuys emphasised the need to regulate and redefine currencies with legal means (which presupposes some kind of state apparatus). For Beuys, as for Harvey, the problem was that money had become a commodity in its own right, and therefore an object of speculation. Money should never be treated as a commodity; it should instead be a legal document (Rechtsdokument) that can be used as a regulatory instrument.49 Money, in other words, should not be seen as belonging to an “autonomous” economic system; it is a social entity. Instead of valuing it, à la Harvey, insofar as it is a means of exchange, Beuys argues that it needs to become a legal regulatory instrument expressing rights and obligations. Beuys replaced the abstract negation of money à la Jorn with an aesthetic politics of concrete abstraction — or at least with its rhetorical anticipation. There are obviously myriad issues to be had with his repetitive statements on money and their anthroposophical underpinnings, but one fundamental insight or intuition stands: there is work to be done on the inside of concrete abstraction. Beuys started to promote his “theory of money” in the 1970s, which was marked by the consequences of the collapse of the gold standard and the Bretton Woods system, and by the deregulation of financial markets, but interestingly he does not advocate a return to gold or some gold equivalent — the important auratic role of gold in his art practice notwithstanding. Rather, his proposed socialisation of money is in fact a proposal to seize abstraction so as to abolish its present forms. Graeber has argued at length that the history of capitalism is not the story of the gradual destruction of traditional communities and qualitative relations by the impersonal abstraction of the market; “It is, rather, the story of how an economy of credit was converted into an economy of interest; of the gradual transformation of moral networks by the intrusion of the impersonal — and often vindictive — power of the state.”50 The era of the historical commons was marked by (local) virtual credit systems, and these disappeared when metal and later paper currencies were imposed as sole legal tender and capitalism could proceed “to pump more and more labor out of just about everyone with whom it comes into contact (…).”51 Early credit systems, then, were arguably more abstract than later metal-based currencies — but they were also more richly embedded in qualitative social relations, in “moral networks.” The comeback of virtual money not backed by metal in the early 1970s was not a return to such networks; it was, after all, more dependent than ever on the power of the state. The new virtual money sparked a massive wave of financialisation — the rise of credit cards being one symptom. While Graeber maintains that throughout history there has been no linear progression from “barter” (which never existed as such) via metal money through paper money trough virtual money, but that money started as virtual money and has returned to this state, the return to the virtual is one with a difference.52 To use our terms, in ancient empires that used credit money this did not transform the productive sphere, whereas in advanced capitalism virtual credit money, now multiplying itself as digital capital, creates speculative bubbles. Google, Facebook and high-frequency trading on the financial markets alike are depending on algorithmic agents whose time is one of inhumanly fast actions. For Marx, machines themselves stored labour, which is why the increasing role in machinery did not negate the labour theory of value. Machines — constant capital — had to be actively used to transmit the dead labour that was stored in them, and were subject to wear and entropy.55, chapter 15, section 2 (pp. 508–517.).] But what of algorithms that plow on in relative independence, at a nonhuman pace, and don’t particularly need human oversight? The notion of labour time is as problematic in relation to them as it is in relation to the Facebook users or Wall Street traders with whom they form complex amalgams. The labour theory of value seems less applicable than ever. Human employees’ specific qualities are packaged and ideologised — and measured, but untransparently — as “creativity,” “teamwork,” “initiative” and so on.56 As Dean puts it, “Communicative capitalism seizes, privatizes, and attempts to monetize the social substance. It doesn’t depend on the commodity-thing. It directly exploits the social relation at the heart of value.”57 Monetary real abstraction was based on equivalence, on commensurability, but now labour power has gone through the looking glass. It is as though we have gone from geometric abstraction to some non-Euclidian, N-dimensional, infinitely flexible form of the abstract. Time-as-measure erodes; “flexible working hours” means that all hours are potentially working hours, and every encounter potentially becomes a form of networking and hence self-performance. Dean discusses Metcalfe’s Law: “The value of a communications network is proportional to the square of the number of its users.”58 Activists and artists have attempted to quantify the value produced by each Facebook user for this company, sometimes coupled with calls for a kind of wage for users, who effectively work for free.59 Such attempts at “re-quantification” are extremely important, yet the problems they run into are significant in their own right. If the value of a Facebook is indeed “proportional to the square of the number of its users,” this means that the value of an individual’s quasi-labour can and will fluctuate greatly. Thus reestablishing the labour theory of value by widening the net — by including what was previously thought of as non-labour — is not necessarily going to result in watertight calculations. It is a tactical move designed to at least reopen the discussion on adequate remuneration, on exploitation and inequality — and not just for first-world precarians. The qualitative turn of abstraction serves not just to obscure exploitation on the one hand and inordinate profits on the other; it obscures the very criteria that would allow for such discriminations. In the process, as I have argued elsewhere, commodity fetishism morphs from illusion into a reality: value dies indeed appear to be the result of “theological whims.” Hence it comes as no surprise that there is a push for re-quantification, and some of the proposed currencies are part of this wider effort. In the current situation, the tables have been turned and aesthetic practice at times needs to side with quantity. Time-banks in particular are a case in point, as they use time as a direct medium of measurement and exchange, resulting at least in theory in a levelling of the labour market. Your time is as good as mine. That this is not necessarily the case in practice is one of a number of problems with time-banking’s primitivist substitute for the “abolition of money,” which harks back to the early socialism of a Robert Owen. However, time-banking does put the issue of adequate remuneration back on the agenda as a social and political issue — as do the Facebook wage proposals and, for instance, the organisation W.A.G.E. (Working Artists and the Greater Economy), which attempts to remedy the absence of any regulation for artists fees, offering to certify organisations that comply with certain minimum standards. There is of course a much wider drive towards quantification as a means of pushing the concretion of abstraction to a point where its ethical implications become tangible. Fair trade products pledge to give the actual producers a better share of the price than most regular products. As valid as such practices can be they remain caught in the systemic contradictions of global capitalism. This becomes particularly pronounced in the case of a “fair phone” produced in China. The phone uses “conflict-free minerals” and is produced in a factory that the Dutch fairphone producer effectively presents as a counter-model to the notorious Foxconn.60 Yet the basic logic of contemporary design and branding remains intact, and the much-vaunted “transparency” does not take the form of a serious breakdown of the budget. How much goes into the actual production? Such a use of the “fair trade” logic is a far cry from the practices that fly the flag of the commons, yet there is one fundamental similarity: fair trade is an ameliorist anticipation of a more humane and ethical capitalism. Certain attempts to create alternative currencies can also be seen in this light. The currencies step out of a speculative and financialised economy to create alternative circuits, supplements. But like the fatally flawed fairphone, they also point out the need to push immanent practice within the legal protocols and within total design to the point where immanence begins to fray and what is external comes into view; the point at which the negation of our negated commons appears as a real possibility. This, as Marina Vishmidt suggests, is the dimension of futurity that needs to be re-injected into the discourse and practice of commoning.61 While Linebaugh may be right in observing that the commons is now regarded as more future-oriented than communism, its does indeed run the risk of endlessly anticipating a future state that it is content to run as a small-scale test, without mounting a substantial challenge to a permanent atrophying present. 1. Peter Linebaugh, Stop, Thief! The Commons, Enclosures, and Resistance (Oakland: PM Press, 2014), p. 212. 2. In stating that the expropriation of pre-capitalist producers and their transformation into wage-labourers was the beginning of capitalist accumulation, Marx privileged the case of sixteenth-century England even while acknowledging that the process was more widespread and drawn-out: “The expropriation of the agricultural producer, of the peasant, from the soil is the basis of the whole process. The history of this expropriation, in different countries, assumes different aspects in different countries, and runs through its various phases in different orders of succession, and at different historical epochs. Only in England, which we therefore take as our example, has it the classic form.” Karl Marx, Capital: A Critique of Political Economy. Volume I, trans. Ben Fowkes (London: Penguin, 1976 ), p. 876. 3. See Alexander Kluge and Oskar Negt, Öffentlichkeit und Erfahrung: Zur Organisationsanalyse von bürgerlicher und proletarischer Öffentlichkeit (Frankfurt am Main: Surhkamp, 1972), pp. 299–308 and Geschichte und Eigensinn (Frankfurt am Main: Zweitausendeins, 1981), pp. 28–38, pp. 542–557, etc. The English version of the former book is Public Sphere and Experience, trans. Peter Labanyi, Jamie Owen Daniel and Assebja Oksiloff (Minneapolis: University of Minnesota Press, 1993) and the latter History and Obstinacy, trans. Richard Langston (New York: Zone Books, 2014). 4. Antonio Negri and Michael Hardt have likewise argued that the original accumulation is ongoing, in the form of a “postmodern primitive accumulation” that is to a large extent informational: “informational accumulation (like the primitive accumulation Marx analyzed) destroys or at least destructs previously existing productive processes, but (differently than Marx’s primitive accumulation) it immediately integrates those productive processes in its own networks.” Antonio Negri and Michael Hardt, Empire (Cambridge, MA: Harvard University Press, 2000), p. 258 (italics removed). David Moore has rightfully criticised Negri and Hardt for privileging “informational” accumulation over other forms of contemporary primitive accumulation, which means that they effectively become complicit with the systemic obfuscation of these forms of labour: “Presto, we have globalised information workers. One wonders if the coltan diggers in the eastern Congo shovelling the essential mineral for cell-phones, Sony play-stations and NASA space-stations under the guns of Rwandan-backed warlords, are ‘conscious’ of their new power, and whether their subjectivity was the force behind this constellation of extraction, production and consumption.” David Moore, “Hardt and Negri’s Empire and Real Empire: The Terrors of 9-11 and After,” ACME 2, no. 2 (2003): pp. 112–131, www.acme-journal.org. 5. On the sixteenth century, see Silvia Federici, Caliban and the Witch: Women, the Body and Primitive Accumulation (New York: Autonomedia, 2004). By now, accumulation depends on the inclusion of women, though for those with children, the extra affective labour next to their job or freelance work is still intense — which women and couples who can afford it try to alleviate by hiring legal or illegal nannies and domestic workers, most of which were economically compelled to leave their country of origin. This way, the cultural workers are more free to mine, process and produce information. 6. Kluge and Negt, Geschichte und Eigensinn, p. 553. Author’s translation. 7. Kluge and Negt, Geschichte und Eigensinn, p. 522. Author’s translation. 8. Karl Marx, Grundrisse, trans. Martin Nicolaus (London: Penguin, 1993 ), pp. 100–102. 9. Nancy Fraser, “Behind Marx’s Hidden Abode,” New Left Review, no. 86 (March / April 2014), p. 66. 10. Jodi Dean, The Communist Horizon (London: Verso, 2012), p. 155. 11. Dean, The Communist Horizon, p. 156. 12. See also Matteo Pasquinelli, “The Labour of Abstraction: Seven Transitional Theses on Marxism and Accelerationism,” Fillip, no. 19 (2014), matteopasquinelli.com. 13. Mary Wisniewski and Ann Saphir, “Thousands in Chicago Protest Financial Industry,” Reuters, 10 October 2011, www.reuters.com. Brian Holmes discussed this episode in a lecture at the Stedelijk Museum Amsterdam on 14 September 2014 in the context of the lecture series Aesthetics of Crisis. 14. The first and only issue of Van Doesburg’s magazine Art Concret came out in 1930, but the term was discussed and used widely in the years to come. 15. Liam Gillick, “Abstract,” written for the project Abstract Possible, Museo Tamayo, 2011, www.liamgillick.info. 16. When Barack Obama posed in front of Mondrian’s Victory Boogie Woogie during a “Nuclear Security Summit” in The Hague, accompanied by a curtsying museum director, Mondrian’s unfinished final work was integrated into contemporary circuits of abstraction in a rather different, rather sinister manner. The victory over fascism, to which Mondrian’s title refers has become that of an Empire without external borders, but with plenty of internal contestation. Economic, technological and juridical means are used in equal measure, and in close coordination and integration — from “free trade” agreements and monetary policy via drone warfare and surveillance to extraditions and imprisonment. For The Hague and its lickspittle museum director, the global security circus coming to town is a fine chance to promote tourism. What better PR than to have the master of “surgical” drone strikes and of global and near-total NSA surveillance pose in front of Mondrian’s fragile collage grid? Abstraction has become a reality in ways the pioneers of abstract art could not have dreamed of. 17. Michel Serres, Petite Poucette (Paris: Le Pommier, 2012), p. 75. Translated by Daniel W. Smith as Thumbelina: The Culture and Technology of Millennials (Washington, DC: Rowman & Littlefield, 2014). Unfortunately, Serres’s perceptive analysis of the structural transformations of contemporary society is marred by an at times grotesque blindness to the ever more complete installment of a system of control. In Serres’s world, the Edward Snowden revelations (which occurred after Petite Poucette was published) are proof that everything is going swimmingly, since they demonstrate that a single man can “take on” the NSA and Silicon Valley. See Michel Serres, interviews with Martin Legros and Sven Ortoli, Pantopie: de Hermès à Petite Poucette (Paris: Le Pommier, 2014), p. 347. 18. Serres, Petite Poucette, p. 72. 19. See also “Living With Abstraction,” in Idols of the Market: Modern Iconoclasm and the Fundamentalist Spectacle (Berlin: Sternberg Press, 2009), pp. 125–156 and “Inside Abstraction,” e-flux journal, no. 38 (October 2012), www.e-flux.com. 20. I call this the Weber-Habermas-Bourdieu account since Habermas and Bourdieu have arguably developed the most influential late-twentieth-century elaborations on Weber’s analysis of the differentiation between social spheres in modern society; Habermas staying more closely to Weber, and Bourdieu creating his own complex account of semi-autonomous fields. 21. In a usage that differs from mine, artist Falke Pisano employs the term “concrete abstraction” to refer to modernist abstract art and its attempts to concretise abstraction in formal and material terms. See Falke Pisano, “Concrete Abstracties,” Metropolis M, no. 5 (2005): pp. 72–75. 22. The term “programmed art” was used by the designer Bruno Munari from 1962 onwards; Munari regarded it as a specific form of kinetic art. 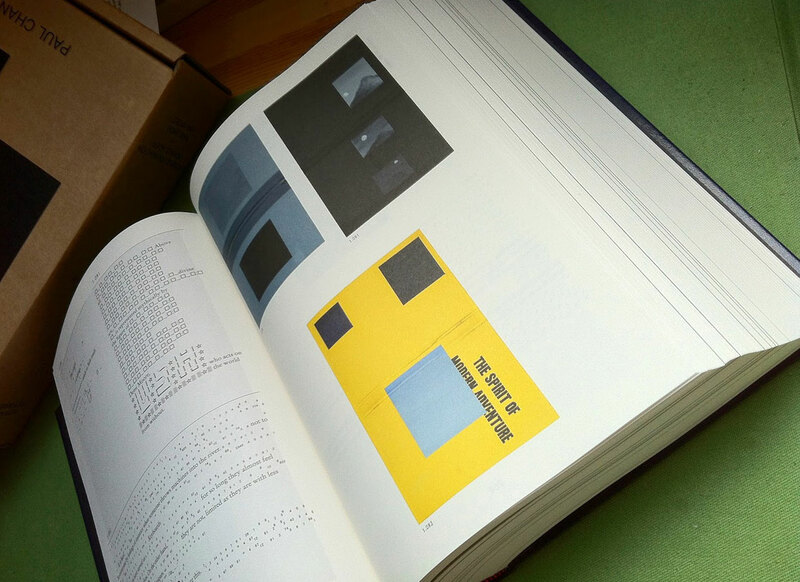 See Bruno Munari, “Arte Programmata”  in Margit Rosen, ed., A Little Known-Story about a Movement, A Magazine, and the Computer’s Arrival in Art (Karlsruhe / Cambridge, Massachusetts: ZKM / MIT Press, 2011), p. 176. For a later use of the term in the context of the budding field of computer art, see Josef Hlavacek, “On the Interpretation of Programmed Art” [1969 / 1971] in Rosen, pp. 438–441. 23. See ArtRank FAQ, artrank.com. 24. See also my essay “Paul Chan’s Book Club” in Paul Chan, ed., New New Testament, pp. 1017–1032 and the forthcoming extended version of this text, “Rewriting the Book,” in Dissect no. 2 (2015). 25. This particular Volume is not part of the Volumes installation in the collection of the Emanuel Hoffmann Foundation, which comprises 1005 book covers. 26. Stewart Martin, “The Absolute Artwork Meets the Absolute Commodity,” Radical Philosophy, no. 146 (November–December 2007): pp. 22–23. 27. See Karel Kosík, Die Dialektik des Konkreten: Eine Studie zur Problematik des Menschen und der Welt (Frankfurt am Main: Surhkamp, 1967). 28. This little drawing showed up time and again as part of Reinhardt’s collage cartoons on modern art from 1946 onwards. The “what do you represent” punchline was originally by artist and theorist Wolfgang Paalen. See Wolfgang Paalen, introduction to Form and Sense (Problems of Contemporary Art no. 1) (New York: Wittenborn, 1945). 29. On self-design see Boris Groys, “The Obligation to Self-Design,” e-flux journal, no. 59 (November 2014), www.e-flux.com and “Self-Design and Aesthetic Responsibility,” e-flux journal, no. 7 (June 2009), www.e-flux.com. 30. Natascha Sadr Haghighian, “Dear Artfukts, Look at My Curve: A Report to an Academy,” 9 Artists (Minneapolis: Walker Art Center, 2013), p. 9. 31. Relevant projects by or involving Fraser are the abandoned Artigarchy project, a collaborative proposal for collecting and visualising data about powerful art world players’ cultural, economical and political interests, as well as her Here You Are (2010) — a series of posters for the Steirischer Herbst that mapped aspects of both the participating artists’ and the visitors’ social and geographical profiles. Creischer and Siekmann have a longstanding engagement with the “pictorial statistics” developed by Otto Neurath and Gerd Arntz in the inter-war period. 32. Hal Foster, Design and Crime and Other Diatribes (London: Verso, 2002), pp. 17–18, p. 19. 33. Foster, Design and Crime, p. 19. 34. Armengaud, Aîné, Armengaud, Jeune and Amouroux, trans. William Johnson, The Practical Draughtman’s Book of Industrial Design and Machinist’s and Engineer’s Drawing (London: Longman, Brown, Green and Longmans, 1853), p. iii. 35. See Matthew Teitelbaum, Montage and Modern Life, 1919-1942 (Cambridge, Massachusetts: MIT Press, 1994). 36. Metahaven, “Captives of the Cloud: part I,” e-flux journal, no. 37 (September 2012), www.e-flux.com. 37. Metahaven, “Captives of the Cloud, Part III: All Tomorrow’s Clouds,” e-flux journal, no. 50 (December 2013), www.e-flux.com. 38. Metahaven, “Captives of the Cloud, Part III”. 39. See also Brian Holmes, “Do Containers Dream of Electric People? The Social Form of Just-in-Time Production,” Open!, no. 21 (2011), pp. 30–44. 40. Sharon Gillett and Mitchell Kapor, “The Self-governing Internet: Coordination by Design,” presented at Coordination and Administration of the Internet Workshop at Kennedy School of Government, Harvard University, Boston, Massachusetts, September 8–10, 1996, ccs.mit.edu. It should be noted, however, that the text itself does not use the term “the cloud” and that the diagram is a representation of the Internet as such, not of the emergence of “cloud computing” in the sense of the ever greater amount of data that are stored not on local computer networks but in remote data centers (“the cloud”). On the concept and the history of the term, see www.technologyreview.com. 41. This is perhaps more evident with Superflex and their various “copy” and “free” projects than with Agency and their collection of legally contested “things,” but many — if not most — of the latter are products of “designer capitalism” in one way or another — from toys and novelty items to patented bacteria. 42. This example forms the point of departure of Wolfgang Paalen’s essay Form and Sense, p. 58–64. 43. Asger Jorn, “Value and Economy” , in The Natural Order and Other Texts, trans. Peter Shield, (Aldershot: Ashgate, 2002), pp. 117–217. 44. McKenzie Wark, “#Celerity: A Critique of the Manifesto for an Accelerationist Politics,” speculativeheresy.files.wordpress.com. 45. One of the most ambitious projects on cryptocurrencies is the Institute of Network Culture’s MoneyLab, though contributors tend to be true believers who see the glass as half full. See networkcultures.org. 46. Matthew O’Brien, “Why Bitcoin Will Never Be a Currency—in 2 Charts,” The Atlantic, 15 December 2014, www.theatlantic.com. 47. Red Pepper, “David Harvey Interview: The Importance of postcapitalist Imagination,” August 2013, www.redpepper.org.uk. 48. See 16 Beaver, “A Common(s) Course: Commoming the City & Withdrawing from the Community of Money,” 16beavergroup.org. 49. Joseph Beuys et al., Was ist Geld? Eine Podiumsdiskussion (Wangen: FIU-Verlag, 2009). In the earlier “Aufruf zur Alternative” (1978), Beuys had used the term Rechtsregulativ [legal regulative instrument] instead of Rechtsdokument. Joseph Beuys, “Aufruf zur Alternative,” Frankfurter Rundschau, 23 December 1978, www.impuls21.net. 50. David Graeber, Debt: The First 5,000 Years (Brooklyn: Melville House, 2011), p. 332. For a more general view see, pp. 308–345. 51. Graeber, Debt, p. 346. 52. Graeber, Debt, pp. 361–387. On the “myth of barter,” see pp. 21–41. 53. See Serres, Pantopie, pp. 82–85. 54. Google’s “baseline study” received widespread media attention; see for instance Charlotte Alter, “Google Seeks Human Guinea Pigs for Health Project,” Time, 28 July 2014. 55. See esp. Marx, Capital: A Critique of Political Economy. Volume I, trans. Ben Fowkes (London: Penguin, 1990 ), chapter 15, section 2 (pp. 508–517.). 56. See also one of Harun Farocki’s last films, A New Product (2012). 57. Dean, The Communist Horizon, p. 129. 58. Dean, The Communist Horizon, p. 129. 59. See Laurel Ptak, Wages for Facebook project / campaign, eyebeam.org. 61. Marina Vishmidt, “All Shall Be Unicorns: About Commons, Aesthetics and Time,” Open!, 3 September 2014, www.onlineopen.org.